Vuitton Persona is an all-capital two-color custom font designed for Louis Vuitton Malletier, a French luxury fashion and leather goods company. The typeface was designed to fulfil the needs of the Special orders department, “Mon Monogram.” Hand-painted stripes and monograms are part of the Vuitton heritage, and it was natural to apply this to new technologies. The new typeface was created in order to rediscover historical in-house letterforms from the early 20th century. 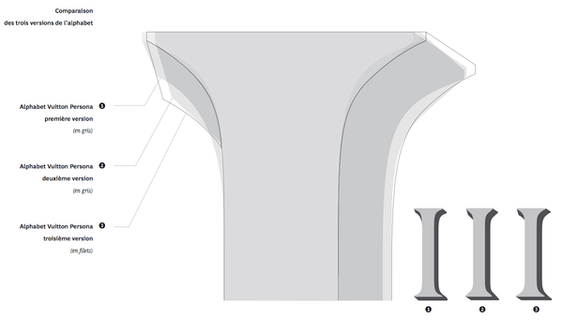 Comparison of the various asymetric serif design. The final one is on 3. The Vuitton Persona typeface is part of a service offer: clients can now order unique bags with their initials and select two-color combinations in particular shops and via their website. 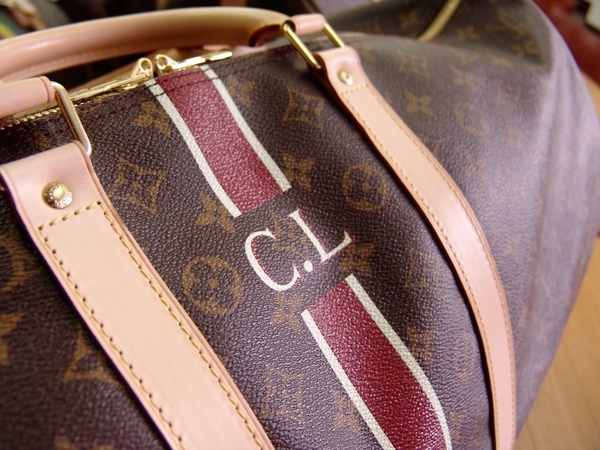 The initials are printed with high-quality ink on the famous “Monogram canvas” before hand assembly of the final bag or luggage. The typeface was designed in OpenType format with a unique feature, specifically developed for the two-color letters. Because the font is delivered with all letters and their meticulously designed shadows, it was necessary to develop an easy method to set texts directly in applications without the need of the glyph palette or layout modification. The user just keys each letter, followed by an equal sign, and the contextual feature is applied, with corresponding shadows appearing in the right position. 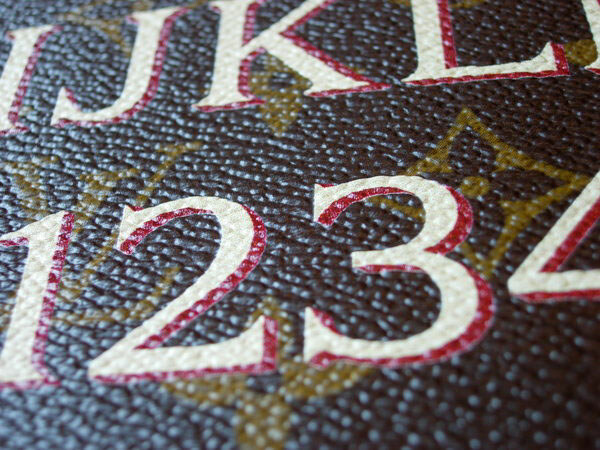 Because of the canvas material as the final medium and high level of Louis Vuitton production, the typeface is designed to be set only between 2 and 4 cm high. Others optical sizes are on the way, as support for various scripts. 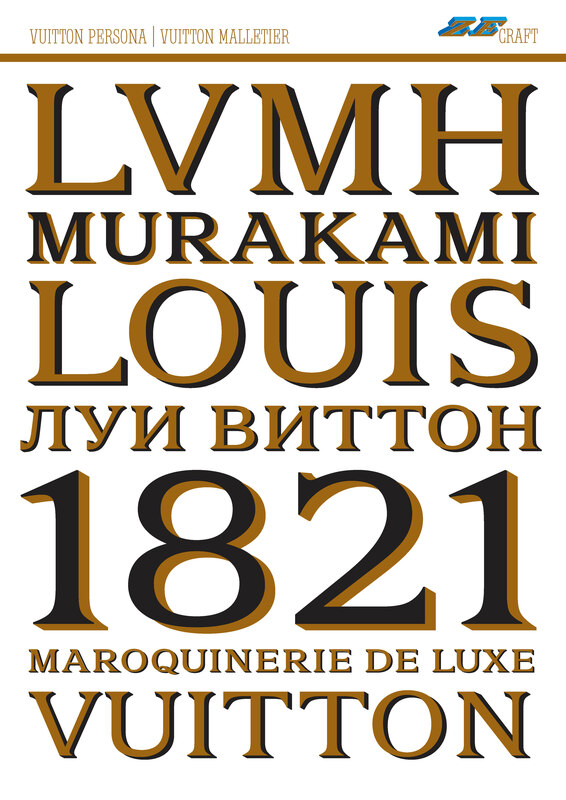 Typeface designed for exclusive use by Louis Vuitton Malletier and will never be publicly available.